The Pilatus PC9/A is a single engine, low-wing tandem two-seat, Swiss made training aircraft. The aircraft is powered by a Pratt and Whitney PT6A-62 turbo prop engine and is fitted with two Martin Baker Mk AU 11-A ejection seats. The PC-9 is a much more powerful evolution of the PC-7, just retaining the overall layout of ist predecessor but preserving very little structural commonality. It features a larger cockpit with stepped ejection seats and has a ventral airbrake. The PC-9 program began in 1982, with some aerodynamic elements tested on the PC-7. The first pre-production PC-9 flew in1984. Further extensive modifications led to the Beech Pilatus PC-9 Mk.II (now T-6A Texan II), for the US JPATS competition. This aircraft is now built and marketed independently by Raytheon. In 1997, the PC-9 (M) was introduced as the new standard model. It features an enlarged dorsal fin to improve longitudinal stability, modified wing root fairings, stall strips on the leading edges and new engine/propeller controls. The world-wide users are : Angola, Australia, Croatia, Cyprus, Iraq, Ireland, Myanmar, Oman, RAF ( evaluation only )Saudi Arabia, Slovenia, Switzerland, Thailand, US Army ( evaluation only ), and Condor Flugdienst in Germany and not to forget Raytheon T-6A Texan II modification of PC-9 including USAF, USN, Canada and Greece. 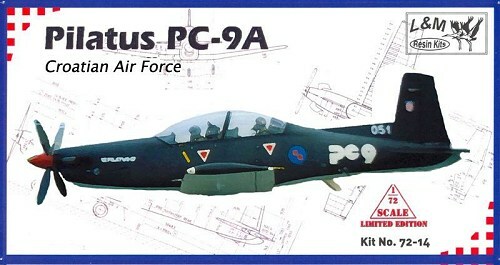 After a long wait, there is finally a PC-9 kit in 1:72 scale, released by L & M model company, from Croatia. The only previously available PC-9 kit was from Aeroclub, long time out of production, an not being entirely accurate. A new-tool 1/72 PC-9 kit scale released by L & M captured the proper lines of Pilatus made aircraft. It’s important to point out that this is a limited edition kit, which means that is a short run, made in resin but this disadvantage doesn’t mean that is not made by today's standards of a modern kits. On the box there is all black side view of a first of three PC-9 in Croatian AF colors, used only on the first aircraft in very short period around 1997. Later the Croatian AF acquired additional 17 new PC-9M aircraft, making the total of 20 of them and Pilatus remanufactured first three CrAF PC-9 to M standard and given all of them a new, combination of white and red, aerobatic like colour scheme. Pilatus PC-9 within Croatian AF replaced Utva 75 light aircraft in the advanced training role. Curiously, but neighbor state Slovenia, around the same time also bought some of the Pilatus PC-9 and PC-6 aircraft second hand. Additionally, there is also a L & M PC-9 1:72 model kit, produced with a different artwork, with a Slovenian AF on it. It is the same kit inside, but this time with different decals for Slovenia. Opening the box you can find around 50 resin parts, two vacu-form made clear canopies and decal sets with instruction booklet. 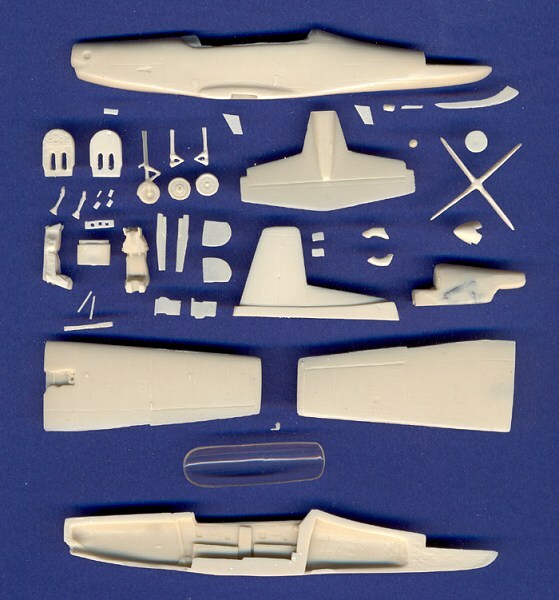 There are two main fuselage parts, split vertically, two wings, vertical and horizontal stabilizer, cockpit, seats and many, many tiny parts like antennas, jogs, tubes, wheels and so. The surface finish is smooth and all the parts are produced to a very high standard with crisply engraved panel lines. There are no nasty ejector pin marks or air bubbles anywhere on my specimen, and imagine, nose weight is given. Nice touch L & M. The dry fit test of the fuselage and wings didn’t unveil any gaps between or any other disadvantage … and what is important, it fits nicely to my Pilatus procured planes of actual aircraft. Next is the booklet … or instructions, with brief history of the plane and users, and diagram of parts, few actual photographs of aircraft (again, nice touch L & M) and assembly instructions with 3 view color scheme. 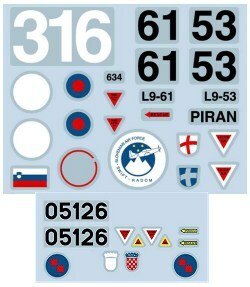 Decals are provided, in this version for Croatian AF aircraft number 051, all black, and 052 white red color schemes. Slovenian version has decals for other two aircraft in Slovenian AF colors. There are also indications, that there will be soon another version of Pilatus PC-9M aircraft, and PC-9A (M) aircraft with decals for Thai AF, RAAF, and new version of Croatian and Slovenian AF. Finally there is entirely accurate PC-9 kit in 1:72 scale, with smooth surface finish and very high standard produced parts with crisply engraved panel lines. This kit is not for the beginners, but it would certainly deserve to take a place on many modelers shelves. Thanks to Mr. Likso, manager of a L & M model company for proving me with the kit.